right fan for you and your space. With such a broad range of fans to choose from, it's easy to get lost in phrases like sloped-ceiling adaptable, blade span and 14-degree blade pitch. And all the questions: Big or small? How many blades? What controls do I need? Et cetera, et cetera. There can really be a lot to think about when it comes to buying ceiling fans. 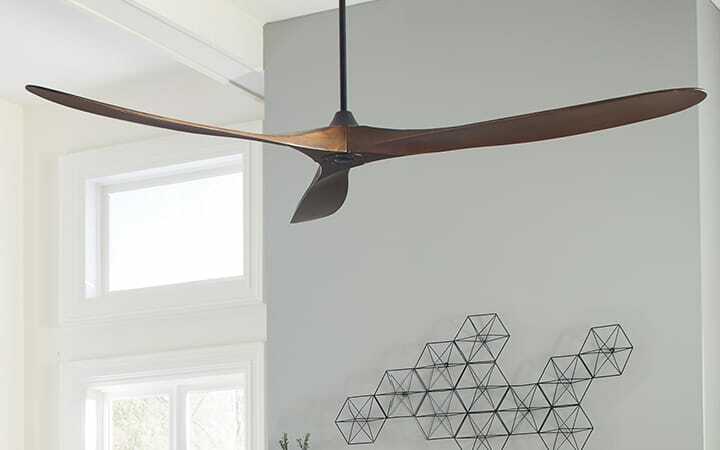 So, if you want to brush up on all the technical jargon before making the wisest ceiling fan choice possible, you can do so here by checking out the following FAQs (plus, other ceiling fan articles, to your right). What are my ceiling fan mounting options? There are several options available, each designed to optimize air circulation and fit proportionally into a space. Regulations do require fans to be installed at least 7 feet up from the floor. (Before choosing a low-profile fan, be sure to measure the space between your ceiling and floor.) Aside from that, you can choose the fan mounting that best suits your room and, of course, your style. Hugger Ceiling FansThis type of flushmount ceiling fan is ideal for low ceilings (8 feet or shorter). 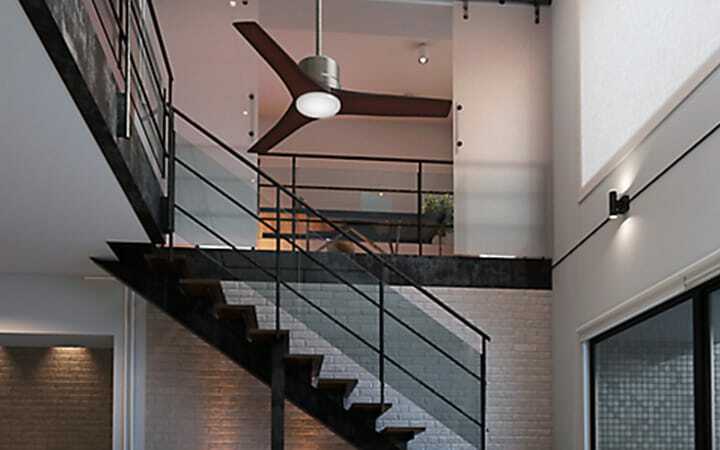 There is no space between the ceiling fan's motor housing and the ceiling, making it an ideal choice for smaller urban spaces, including apartments and condos. Close-to-Ceiling FansA downrod of 3 to 5 inches is installed between the ceiling canopy and fan. The added space between the low profile ceiling fan and ceiling allows for more air circulation and fan efficiency, while remaining relatively close to the ceiling and out of the way. This mounting option is good for any room where the ceiling-to-floor height is roughly 9 feet. Ceiling Fans with DownrodsIn rooms with high ceilings, it is a good idea to add longer downrods to your ceiling fan to successfully extend it. This is an ideal configuration for great rooms, lofts and expansive entryways with noticeably tall ceilings. Most large ceiling fans include a downrod as a mounting option, since they will likely be placed in a room with high ceilings. However, you should double check that the included downrod length is enough for your space. What about the actual installation of a ceiling fan? We highly recommend consulting with your electrician to make sure a fan is properly installed. However, if you are planning to install the ceiling fan yourself, any fan you choose at Lumens will come with step-by-step, guided instructions. Before you install any fan or light, remember to turn off any live power from your junction box to safely install the fixture. With electricity turned off, you can begin following the steps to properly wire the fan, assemble its downrod (if it’s for a tall ceiling), install the light kit (if one is included) and attach the fan's blades. Whether you are installing a ceiling fan in a new space or simply replacing an old fan, the process will be relatively similar. Should I choose an ENERGY STAR-Qualified ceiling fan? Rising utility costs and an ever-increasing challenge to eliminate waste means we must get technologically creative. Investing in a ceiling fan with an ENERGY STAR label is a practical option that allows you to minimize waste while maximizing a financial benefit. The EPA came up with the ENERGY STAR label for two reasons: (1) to recognize units that have passed a rigorous testing process to prove they’re highly efficient, and (2) to make it easier for consumers to identify and purchase energy-efficient, bill-saving products that won’t sacrifice performance or comfort. Plus, ENERGY STAR ceiling fan models must come with a minimum 30-year motor warranty, a one-year component(s) warranty and a two-year lighting kit warranty. At Lumens, look for the ENERGY STAR label on a fan’s product page to determine if it is ENERGY STAR qualified. How do I choose a fan for a sloped ceiling? Some fans include a sloped ceiling adapter that can accommodate angled ceilings. Check the details carefully, as each ceiling fan manufacturer has different specifications. If the fan is a standard mounting fan and it is intended for use on a sloped ceiling, it is necessary to purchase a separate sloped-ceiling mounting kit. Especially true for fans being mounted on sloped ceilings, extra downrods may be necessary if the room has a high vaulted ceiling. Finally, keep in mind that some ceiling fans just can't be adapted for a sloped ceiling. It is always good to double check this detail before purchasing a fan for a sloped ceiling. What is the difference between 4-blade and 5-blade ceiling fans? 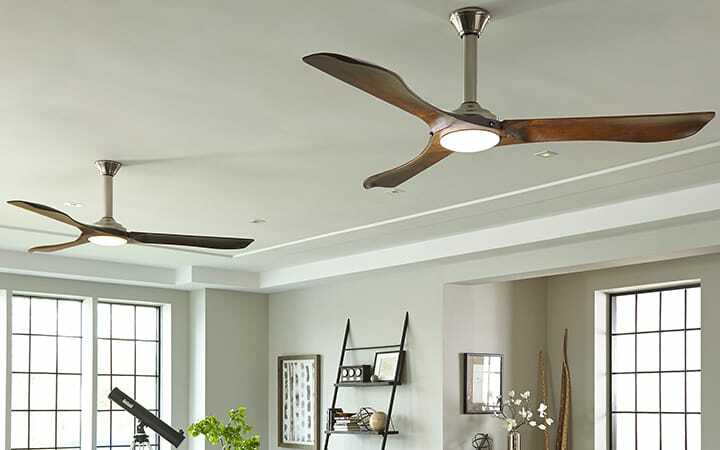 The main difference between a 4- and 5-blade ceiling fan is one of aesthetics and personal taste. However, the laws of physics do dictate a slight difference in performance between ceiling fans with different numbers of blades. As a rule, as the number of blades goes up, the fan tends to be quieter and circulates less air. 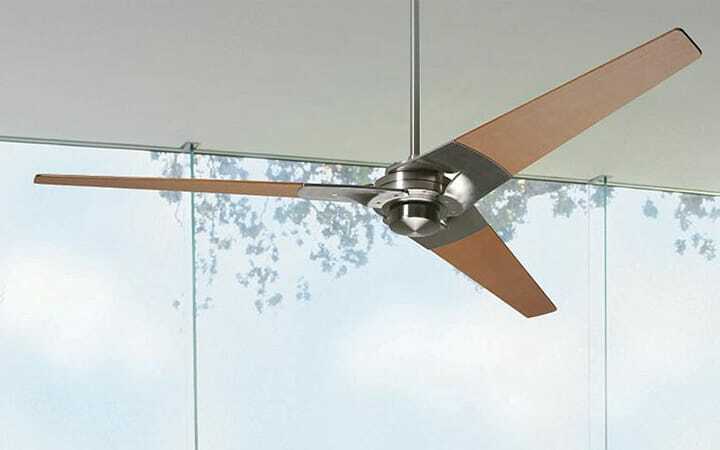 Additional blades increase the drag on a ceiling fan's motor and slow it down. This is one of the reasons why industrial fans (like wind turbines) usually have only two or three blades. They can go faster and move more air, and noise isn't so much of a concern. Many ceiling fans designed for the home come standard with four or five blades. Beyond having a pleasing symmetrical aspect, it's at the 4-blade and 5-blade level that the ideal balance is achieved between the amount of air circulated and amount of tolerable ambient noise. These days, you are unlikely to notice any major difference in job performance between fans with fewer or more blades. 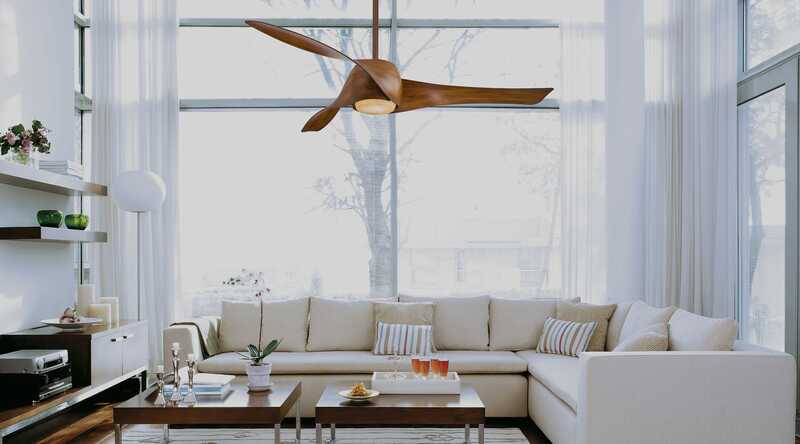 Advancements in overall residential ceiling fan design, balance, and low-drag blade shapes and pitch ensure that ceiling fans with a non-standard number of blades are able to do their job well. Even if you opt for a ceiling fan with an expansive seven blades, you can rest assured it will still perform well. Blade pitch is the angle, measured in degrees, between a 180-degree horizontal plane and a ceiling fan's blade tilt. The angle of the blade makes a difference in how much air a fan can circulate throughout a room. The optimal blade pitch for a ceiling fan is 12-15 degrees. This degree of blade pitch will allow your ceiling fan to move a “just right” amount of air...not too much (you don't need a wind tunnel) and not too little (you do need to feel a nice breeze). Be sure to browse through all the features of a fan's product page to identify its blade pitch, as well as blade span and air efficiency metrics. Do I need a remote control for my ceiling fan? When fan location is not an issue, the main advantage of a remote control is one of convenience. You can control a ceiling fan’s speed, direction and lighting without having to get up and manually pull chains or flip switches on the wall. Handheld Remote:With a handheld remote, a ceiling fan can be controlled from any location within the remote control's range. Wall Control:With a wall control, you'll still have to get up and go to the control. However, it doesn't have the potential to get lost and can be installed as easily as a light switch. Handheld/Wall Combo:Combines the convenience of both wall and handheld controls, with a wall-mounted holder supplied to hold a portable, handheld unit. fanSync by Fanimation:A smartphone application that allows you to control the speed and lighting of your fan from the convenience of your mobile device. Unfortunately, adding a remote to an already installed fan is not usually as simple as putting batteries in the remote control. The receiver for handheld remotes and some wall-mounted controls often need to be installed inside the fan. This process may require that part of the fan be taken apart and then put back together after the receiver has been added. Most receivers can be added to the existing electrical wiring and will sit inside of the ceiling fan's canopy. From there, you sync the remote to its receiver. For the remotes and wall controls available, see our selection of ceiling fan parts. Otherwise, check the product details of a fan you are interested in to verify if it already includes a remote control. Should I buy a ceiling fan with a light kit? Start by determining how much light is already in the room. Is it a relatively open space with lots of windows, or do your sliding glass doors allow in natural sunlight? How many lamps are already in place? Do they provide adequate lighting? These are important considerations to think of when deciding if your fan needs a light kit. If you wish to have more control over the amount of light in a room without worrying about turning on five individual lamps, a ceiling fan with a light or a light kit may be the best option. Ceiling fan light kits provide ample, even light that's beneficial to all types of spaces. And many light kits are compatible with a wall dimmer or remote, so adjusting the light intensity is as easy as pressing a button. Consider pairing ENERGY STAR fans with ENERGY STAR light kits, too. They’re proven to be 50% more efficient than conventional fan/light units, saving you more than $170 in energy costs over the fan’s lifetime. The lighting is efficient and long lasting, too, so you won't have to make bulb changes as frequently. What is the difference between damp, dry and wet-rated fans? Outdoor and patio ceiling fans come with a rating that indicates if it can safely be used in exterior areas. This rating, usually known as its UL Rating, is used to define how much water the fan can be exposed to. Dry Rated Ceiling FansNot meant for outside. Being exposed to moisture and outdoor elements will destroy these fans quickly, particularly the blades. This type of ceiling fan is meant for indoor use only. Damp Rated Ceiling FansOkay for covered outdoor areas (also referred to as damp location fans). Damp rated ceiling fans can handle the moisture that comes with outdoor air, but cannot have direct contact with water, rain, snow or other liquids that a life outdoors could bring. Damp-rated fans also use materials that prevent rust and corrosion from outdoor elements. Wet Rated Ceiling FansWeather resistant and okay for all-weather outdoor applications. The motor casing and blades of wet rated ceiling fans are resistant to snow, ice, rain and even water from a hose used to clean them. The finishes used in wet-rated fans also help prevent corrosion and rust. By understanding ceiling fan ratings and knowing what to keep an eye out for, you'll be better able to choose the best outdoor fan for your patio, porch, gazebo or covered deck.